President Trump reportedly planning to meet with advisers, Ambassador Friedman to decide on date for release of Mideast peace plan. President Donald Trump is set to decide this week when the administration will begin the rollout of the much anticipated Middle East peace plan. Dubbed the ‘Deal of the Century’ by the president, the plan will include a framework for final status talks ultimately leading to an agreement between Israel and the Palestinian Authority. According to a report Sunday evening by Channel 10 which cited senior American officials, Trump is scheduled to meet with senior administration officials this week to settle on a date for the plan’s release. 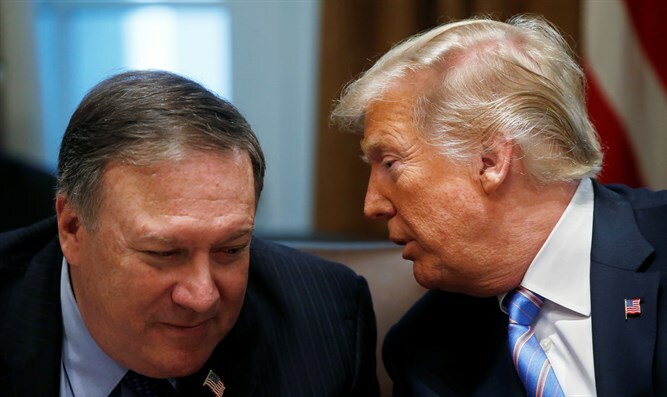 Secretary of State Mike Pompeo and US Ambassador to Israel David Friedman, who flew back to Washington recently to take part in the meeting, are among the senior administration members who will sit down with the president to plan out the ‘Deal of the Century’ rollout. National Security Advisor John Bolton, senior White House adviser Jared Kushner, and special White House envoy Jason Greenblatt are also expected to take part in the meeting with the president. President Trump is reportedly anxious to unveil the plan as soon as possible, and is still eyeing a December 2018 release. Senior officials within the Trump administration, however, advised the president to delay the peace plan’s rollout, especially if Israel holds early elections. Ambassador David Friedman reportedly advised against releasing the peace plan during the Israeli election season, saying turning the election for the 21st Knesset into a referendum on the peace deal would be a mistake. The ongoing political turmoil in Israel and the possibility of early elections are said to be a key consideration in the timing of the peace plan’s release. Earlier on Sunday, a senior Israeli official told Arutz Sheva that the Israeli government had urged the US to push off the release of the peace plan in the event that Prime Minister Binyamin Netanyahu’s ruling coalition collapses and new elections are called. “The Americans understand very well the situation in Israel, and they know that it wouldn’t be right to release a peace plan in the middle of an election season, and could even be interpreted as interference in Israeli domestic affairs,” the official told Arutz Sheva.